Clematis cirrhosa "Wisley Cream" January 2009. Just like my previous photo of Garrya Elliptica "James Roof ", this pretty clematis "Wisley Cream" gives good winter interest, flowering for many weeks, including December and January. Very nice. Wish I could have some blooms in dec and jan! Gorgeous! I'm with you Newfienurse, all we have right now is a lot of snow and ice. I think you're probably worse off in ONtario than we are here in newfieland, Gillian! Good luck with rest of winter. For me, it is like having spring blossom all through winter. That's a lovely plant, TT. How big does it grow? If you are asking about height, well it is climbing way over 12 feet and not stopping ! It does take a couple of years to get started, but then it romps away ! I photographed this angle from almost underneath the flowers which are about 7ft above the ground. It has been flowering for weeks now. That really is lovely TT. I didn't realise how many types of clematis there are until I bought a book in the charity shop which list '60 of the best'. I guess there are even more. Yes, this is one of the evergreens. It has small dainty leaves. Some types have huge leaves ! As you say, many more lovely types of clematis. Sounds like you found a good charity shop bargain with your clematis book ! thats definitley one for my list, i have a few Clematis and they are one of my all time favourites, this looks beautiful Terratoonie. I hope you manage to buy one. Oh TT......wow...yours is out early!....Do you prune it at all?.....I have some bells waiting to open but not many yet and it's usually beginning of Feb that they do. It looks beautiful! Hi Janey ~ Thank you. This clematis had bells in flower back in December. On internet it says flowering period December - February. It is in a sunny location. Maybe that helps ? I don't prune it, but it is getting rather tall, so I may have to trim it this year. Does yours get a haircut ? My previous photo is James Roof and I call him " J R "
If you find any useful info. I would be grateful if you would add a further comment on this thread. Thanks. How lovely TT. You are lucky to have flowers at this time of year. fantastic TT, lovely flowers, mine is still tiny, so will proberly have to wait a year or two for it to make it's way up the trellis first, it looks much healthier though which is good, but still no sign of flowers for this year, oh well looks as if it will be worth the wait. thanks for sharing this with us. Once your "WC" gets taller, it will have lots of lovely flowers, probably from December to February. How lovely to see such pretty flowers when gardens tend to be asleep for the winter - well mine does at the moment. And it's so dull, cold and soaking wet - been pouring with rain and blowing a gale all night again. Come on spring - hurry up! Great pic. Yes, cold, blustery weather this week ! It is really pouring down here ! Mine has its first open flowers today - I am about to post a photo! The other two C.cirrhosas have been flowering for weeks, but this one seems to be later. I don't mind, as long as it flowers eventually and hey, it's January! Glad to know yours have lots of flowers, Spritz. I've been having a try at making more of these Clematis plants, from shoots growing near the roots of the main plant. Don't know yet if it will work ! If successful, I plan to have these growing in the front garden too ! I don't know this clematis at all, what a great climber to have in the winter, the blooms look untouched by the winter weather..is it scented ? What a beautiful flowering vine! Does this vine only bloom in Winter? 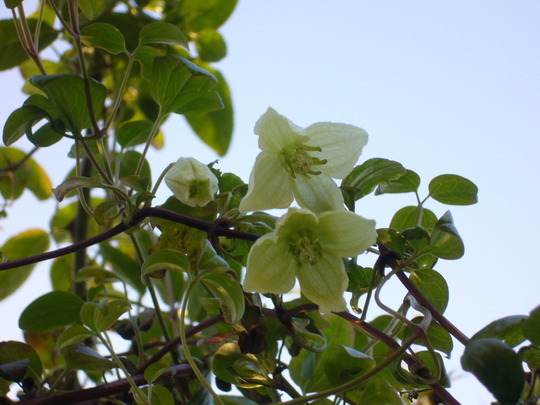 This clematis is evergreen so is attractive all year. I know you like climbers, and I'm guessing you would love this one. I don't think it has scent, but the flowers are high up. This photo was taken sort of from underneath the bell-like blooms. I love the winter flowering plants. This clematis never did well in my old garden but I'm going to try it here and hope for better success. Is it in some shelter with you TT ? I can see why you ask about the shelter, because on the internet it reminds that this clematis can suffer in severe winters. The lower part of my clematis has a bit of shelter - not very much ! - but the top part is very exposed indeed to all the elements ~ sun, snow, rain, wind ! This clematis certainly took a while to get started. So if you get a new one for your current garden, don't be disheartened is it takes a while to grow larger and get lots of flowers. Thanks TT. I'm hoping to plant it somewhere that it will be seen from the house in winter. And you've given me an idea to plant my winter Jasmine with it. Fantastic. The winter flowers seem much more precious and we appreciate them so much. Hi TT, had a look at mine today and it has flowers intertwined with the other climbers. Think I will prune it when the flowers are finished...looking at it it must have been here years. Another one to buy, and being evergreen is a bonus TT, I know just the place for it? Paul is right. The winter flowers on Clematis WC are just like the tassels on Garrya JR ~ very precious winter interest. Lucky that they last for so many weeks ! Good idea, Janey, to trim your Clematis. I reckon my WC will need a little bit of a haircut after flowering. It has become very intertwined with my Winter Jasmine, but I think that closeness does help protect WC from the cold and makes both plants look more attractive. How lovely to see a clematis flowering now! Do you have many climbers ? I have Garrya Elliptica on the next photo. Do you have Passion Flowers ? I'm growing seedlings of those in my kitchen ! Yes, thanks we are fine. This clematis flowers throughout all the coldest weeks of the winter. Now have I room somewhere for one of these?! It's lovely! Do you have room ? despite the freeze and snow of recent weeks ! Lovely so more blooms to come! Truffle is on my latest photo, trying not to be naughty. Lol. In that picture, you can see he's sitting on his favourite place ~ on the round pouffe cushion. How did you know he got me up early ? Lol. Have just ordered my own WC! Hope it get's going for next Winter! Oh, Gwendas, that's exciting ! It is lovely, I love the way it hangs it's blooms. I enjoy photographing shrubs and trees from below. A week into March now, and it is still flowering ! I can't recall exactly when the first flowers appeared, but I think it was back in November. End of August 09 new flowers were already blooming on WC ! So it flowers from August to March !